The good news: books will never go out of fashion as holiday gifts. The bad news: the number of shopping days until December 25th insists on dropping by one every 24 hours. If you’re planning some printed purchases, here a few Austenesque suggestions for you based on what I’ve read and/or heard good things about. Then at the end some blogs where you can find further ideas. Unlike the other suggestions, this one tackles Mansfield Park. If your first thought is “Mansfield Park!” (with a dismissive “!”), then throw away your preconceptions. This is an excellent read. Rich storylines, authentic characters (old and new), and writing I found hard to discern from the original (truly that good). A not-so-secret favourite if you follow me on Twitter. Two of the wittiest Jane Austen creations are Mr Bennet and Mr Collins. 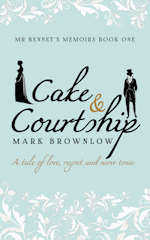 Imagine an ongoing correspondence between the two, replete with Austenesque humour, charm and ingenuity, all wrapped up in an authentic writing style. Voila – you have the Longbourn Letters. I’m not really the target market for this one, but I read it as a quick way to see how different authors tackled the Elizabeth / Darcy dynamic and brought unique perspectives (and different eras) to their stories. Lots of excellent writers contributed and those who like a regular dose of Darcy can dip into it like a big box of Christmas chocolates. If you prefer your heroes a little more rough around the edges, the same editor – Christina Boyd – just brought out a second collection featuring Jane Austen’s less salubrious characters and another great lineup of accomplished authors. *Clicking the cover image takes you to the Amazon page. The only way to legitimately use the covers is through an associate agreement with Amazon. This also means if you buy the book, they give me a “finder’s fee”. Just so you know.